A drop of liquid metal. The major difference between the two is in the temperature which these alloys become molten. 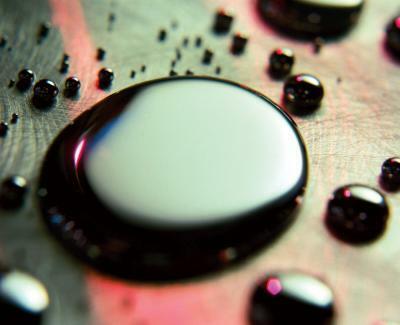 Liquid metals remain molten at room temperatures. The following three liquid metal alloys become liquid at temperatures below 30 °C. Phase Change Metals are applied in solid form and melt when exposed to heated junction temperatures. The most popular phase change alloy melts at 60°C. The resistance obtained with the Indalloy 51 was tested to be less than 0.015 cm2-°C/W. Liquid metals can be compressed to thicknesses below 0.001"
One difficulty encountered when using these alloys is the ability to contain them. All of the alloys which are liquid at room temperature contain gallium. 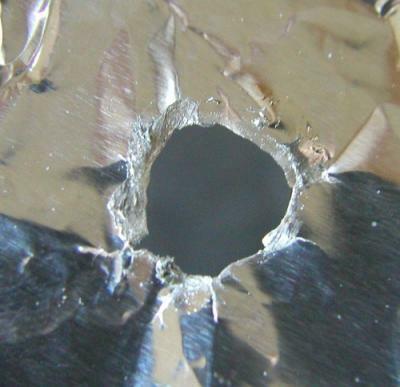 Gallium is corrosive to various metals, especially when hot. As the temperature of the gallium is raised, it becomes increasingly corrosive, reacting through thicker layers in a short amount of time. One metal which gallium is very reactive with is aluminum. It will corrode through .002" thick aluminum foil within hours at room temperature, and at 500°- 1000°C, this reaction becomes much faster. Gallium is non-reactive with other metals however such as molybdenum, tungsten, and nickel. In addition to reacting with metals, gallium with also stick to non-metallic materials, making it difficult to package. Stay tuned for my next blog posting which will discuss packaging options for liquid metals.